Fantastic lakefront home w/ great views, decks & cabana; dogs OK! 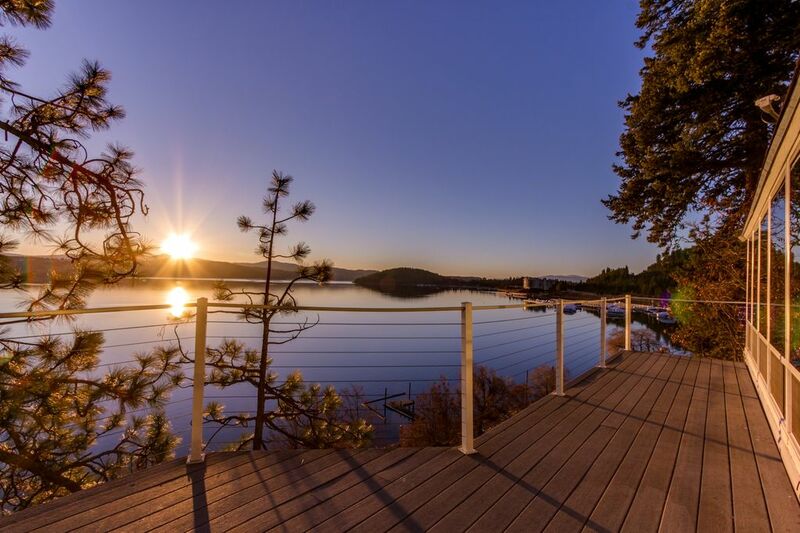 Unwind at this cliff-side oasis with views of Lake Coeur d'Alene, wrap-around decks, and dog-friendly accommodations for nine visitors. The Silver Beach House is a great multi-use space for family reunions, corporate retreats, and group retreats! The home boasts panoramic views of the lake and floating green at the Coeur d'Alene Resort! Ride your bike just one mile to the Trail of the Coeur d'Alene or walk to the beach. The alpine lake is ideal for boating, fishing, and swimming. Divided by two floors, this spacious home offers extra privacy. The Silver Beach House has three bedrooms and two full baths and will sleep nine guests comfortably. The main level has a living room, full kitchen, bathroom, and two bedrooms. Sleeping options include two double beds and a bonus room with a twin bed. The living room is cozy with picture windows overlooking the lake, a gas fireplace, and entertainment including cable TV and WiFi. The sleeper sofa offers extra sleeping options and sliding glass doors lead to the wrap-around deck and cabana! The deck offers lounge furniture and gas grill. Upstairs boasts a private apartment with a living room, kitchenette, master suite, and upper deck. The master suite features a king bed, private bath, and walk-out terrace. Additional home amenities include a garage and washer and dryer. And don't leave Fido at home - you can bring two dogs here, and an enclosed yard offers room for your furry friends to roam (though a nightly fee per dog and minimum fee per stay will apply). Make the four-mile trip into Coeur d'Alene for art galleries, boutiques, and fine dining. Play a round of golf or get spa treatments at the Coeur d'Alene Resort or make the trip to Silverwood Theme Park and Silver Mountain Resort - both are within 35 miles from the house. This breathtaking home offers everything you need to for a special getaway or family retreat on beautiful Lake Coeur d'Alene! Parking Notes: One car will fit in the garage, plus one car in front of garage and one car on the street (limited street parking). Please note no boat trailer parking is available at the home. Water Access: Lakeview with beach/dock access being the public launch. Thanks for considering a Vacasa home! We provide full-service management for privately owned vacation homes, and like to think that we offer our guests the best of both worlds: the unique experience of staying in a one-of-a-kind vacation home, with the peace of mind that comes from knowing that the home you book for your special vacation is cared for by professional housekeepers and property managers. <br> <br> Vacasa began in 2009, simply because our founder and CEO Eric wanted to find a better way to share his wife’s family’s summer home in Long Beach, Washington with guests as a vacation rental. Eric and his early team worked to build Vacasa on the premise that local employees can do what they love most (taking care of guests, homeowners, and properties), while the hands-off tasks of vacation rental management—things like marketing, filing taxes, and maintaining a website��could be handled by a specialized central support team. <br> <br> Our passion is connecting travelers with the unique experience of staying in a vacation home, and we would be honored to be your host. Please contact us with any questions about this home—our team is standing by! Great home, very clean and the views are outstanding. We have a full sized truck and the parking is very minimal, just FYI if you have multiple vehicles. I would recommend this home. Best scenery you could ever get! Thank you for the true retreat feeling that was much needed at that time of the year!! Everything else deserves two stars. It was overpriced, old, and dusty. The furniture was covered in dust and the beds were uncomfortable old spring mattresses with crusty sheets. Updating the mattresses with affordable memory foam mattresses (cheap on amazon) and soft sheets would go a long way. We are sorry to see you not more impressed with your rental choice. We will follow-up with housekeeping regarding the dusting. Thank you! Amazing lake house situated with a perfect view of Lake CDA. Matt -Property Manager was so kind and brought a pack-n-play for my 10 month old to sleep in. My daughter was thrilled there was a "girls" room for her to sleep in. Plenty of living space, great property management and overall made our trip memorable/comfortable. Also, situated very close to downtown CDA and the highway. Hiking, fishing, biking, dining all very accessible from the location of this home! This is a perfect spot for two couples! The owners and Matt with Vacasa went above and beyond to help us with a special request we had. Very comfortable home with amazing views. Convenient location and great options for walks. The furnishing and décor was outdated but the beds were comfortable. Great that it's pet-friendly but the yard is not fully enclosed and there is a steep drop-off so you need to keep an eye on the dog. The deck was great and grilling out there, enjoying the sunset was perfect.